Cockroaches are considered a serious urban pest as they're known to spread disease, contaminate our food and cause allergies and/or asthma, particularly in populations of the very young and the elderly. Generally, they live in filth and as they travel looking for food and water they transfer germs from trash and/or sewage into our living spaces. According to the University of California Agriculture and Natural Resources (UCANR), cockroaches are known to cause infection by carrying bacteria such as Staphylococcus spp. & Streptococcus spp., hepatitis virus, coliform bacteria, as well as causing food poisoning by carrying Salmonella spp. and Shigella spp. bacteria. Historically they have also been linked to typhoid, dysentery and cholera. For successful management of these notorious invaders it is imperative to correctly identify which species you're dealing with. 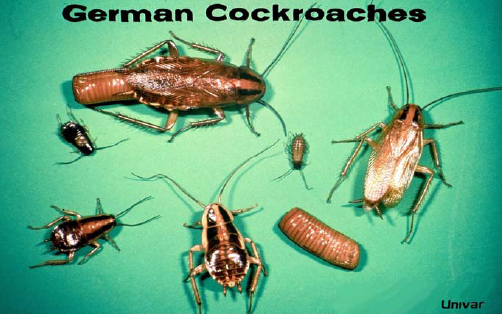 The two most common species found in American urban areas are the American cockroach and the German cockroach. American cockroach adult. Note the tan coloring on the pronotum. Commonly known as the water bug or palmetto bug, they typically reside outdoors near moist, humid environments such as drains, sewers and trash receptacles. Females carry egg case (ootheca) for about a week before dropping it and continuing her search for food and shelter. It incubates for about 2 months before hatching and continuing the life cycle. Ootheca carries approximately 12 young. Female cockroaches can produce up to 800 cockroaches in 1 year. Notorious world-wide indoor pests hiding in cracks and crevices particularly in food prep/storage areas. Their most notable characteristic is their rapid reproduction rate - a single female and her offspring can produce up to 30,000 cockroaches in one year. Ootheca is tan in color and carries approximately 35 young. Droppings look somewhat like black pepper and are smattered around infested areas such as walls, under refrigerators, in cabinets, etc. If you suspect or have sighted bugs, call ExCimex or a Pest Management Professional (PMP) immediately for identification and treatment options. Knowing the species, you will be better able to determine where the source of infestation is and where to place traps, baits, or chemicals. Treatment is not a one-time deal. Repeated steps and ongoing monitoring is necessary. First, locate areas of cockroach activity, then identify the causes of infestation, and look for entryways for bugs to get into your home. The more hiding places you locate and manage, the more successful your control program will be. The key to managing cockroaches is exclusion and sanitation. Vacuuming and removing harborage sites like cardboard, paper products, plastic bags and trash. MONITORING - using sticky traps, pheromone traps, sanitizing and visual examination for weeks following a program. The most important component of managing a cockroach infestation is to change the conditions that promoted infestation in the first place. Cockroaches, along with all organisms, are driven by survival and they are likely to reinvade as long as they find a suitable habitat (i.e, availability of food, water, and shelter). All in all, don't let cockroaches get you down. They are common and they are everywhere, but there are ways to control them! Do the research and call for help. For more information on cockroach identification, life cycle, biology and management check out Pest Notes from UC IPM Online provided by UC ANR.